This is a traditional Greek chicken dish served at festivals and holiday celebrations that happens to be one of the easiest recipes to make, and one of the most tempting to eat. 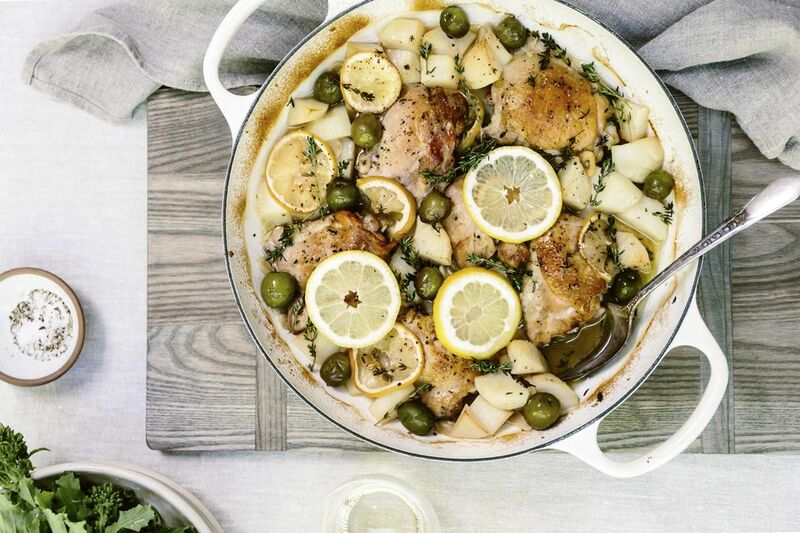 You simply roast chicken pieces and potatoes in an oregano, garlic, olive oil, and lemon juice mixture. You can lessen the garlic if it is not one of your favorite flavors; don't worry—the classic tastes of lemon and oregano will still make this dish uniquely Greek. Make sure you use a Mediterranean oregano for this dish—even better a Greek variety. You don't want to use Mexican oregano as it has hints of licorice and citrus while the Greek version is more savory and earthy tasting. Because the recipe includes chicken and potatoes all you need to round out the meal is a nice salad of cucumbers and tomatoes. Rinse the chicken and pat dry. Peel the potatoes and cut into quarters, lengthwise. Salt and pepper the chicken and potatoes. Transfer chicken to a roasting pan and add potatoes, placing on and around the chicken. Add oregano, garlic, olive oil, and lemon juice, distributing evenly across the pan. Add water and roast uncovered for a total of 1 hour and 40 minutes. Halfway through (at 50 minutes), turn the chicken and continue roasting. Check periodically to make sure there is still a little water in the pan. If needed, add 1/4 to 1/2 cup more.